Traditionally the symbols attributed are Matthew a winged man (not an angel), Mark a lion, Luke an Ox and John an Eagle. These symbols are taken from references in the book of Ezekiel, Chapter 1, verse 10:- "As for the appearance of their faces; the four had the face of a human being, the face of a lion on the right side, the face of an ox on the left side, and the face of an eagle; such were their faces. Their wings were spread out above" In the book of Revelation, Chapter 4, verse 7 there is a similar reference:- "the first living creature like a lion, the second living creature like an ox, the third living creature with a face like a human face, and the fourth living creature like a flying eagle. And the four living creatures, each of them with six wings" It is claimed that it was Saint Irenaeus (140-202 a.d.) in his treatise "Adversus Haereses" who likened them to the four Evangelists because of the content of their Gospels and their particular focus on Jesus. The image attributed to Matthew is a divine man. His Gospel is concerned to show the genealogy of Jesus from Abraham to the King David (14 generations) and from David to the deportation into Babylon (14 generations) and from the exile in Babylon to the Messiah a further 14 generations. Matthew is seen as the Gospel of Christ's humanity and His humbleness and humility are highlighted throughout the book. The image attributed to Mark is that of winged lion. His Gospel begins with references to the Prophet Isaiah. John the Baptist is the messenger who proclaimed the coming of the Messiah. The winged lion, which signifies leadership and royalty, is therefore seen as an appropriate symbol for the Son of God. The image attributed to Luke is that of a winged ox. A calf or indeed oxen were used in sacrifices in the Temple. The opening of Luke's Gospel begins with the announcement of the birth of John the Baptist to his father Zechariah a priest in the Temple who was offering sacrifice there. The winged ox is seen as a reminder of the priestly character of Jesus and of his sacrificial death for the sins of all mankind. The image attributed to John is a winged or flying eagle.This book is totally unlike the three synoptic gospels in that it begins with a lofty theological meditation upon the meaning of the fact of Christ. It concentrates on the long discourses that took place between Jesus and others. The reference in the Gospel to the disciples receiving the Holy Spirit perhaps makes the symbol of a winged or flying eagle even more powerful. 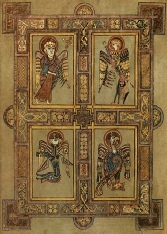 It is suggested by some writers that the wings on each of the symbols of the Evangelists is to show their connection to the divine. Perhaps to be viewed, like angels, as the messengers of God. They are the bringers of the Gospel, that is, the "good news."